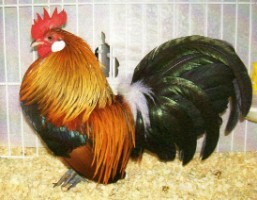 Welcome to the dutch bantam section , We keep, breed, rear and show Gold Partridge Dutch bantam Males. 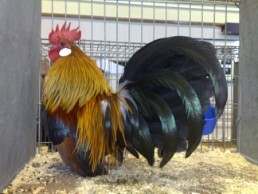 Before I met Paul, for the last fifteen years Paul has created his own unique strain of the Gold Dutch bantams and is also on the Dutch bantam Club comitee. This has taken alot of time and effort and the birds he bred and still breeds are so stunning The Dutch Bantam in its country of origin has been around for a long time, though in Holland a club was only formed in 1946. The breed first appeared in this country around the late 1960's, and this club was formed in 1982. Since then the breed has gone from strength to strength, with 13 colours standardized, though in Holland many more varieties keep appearing... We are really excited about getting our 2012 dutch bantams into the show pens this year.. 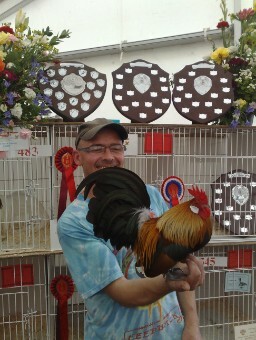 In 2004 Paul was awarded Best True Bantam with his Gold Dutch Bantam Cockerel which was the first time a dutch bantam had ever achieved such a reward...and is known among poultry people as the one with the "tails"..
For stock enquireys please contact the Dutch bantam club secretary for breeders in your area.